We love our volunteers and are excited to share this beautiful Life Essay, written by Lauren. She is fourteen years old. Lauren lives in Michigan and has been involved with Spreading Sunshine since the early days. She’s organized projects at her school. She plays flute, piano and uke. She also runs cross country and track. She is a member of our school LINKS group. She wants to be a music therapist when she grows up. Emerson, Ryder, Max, and David. These are the names of people I know who were born with Down Syndrome. Some people may say Down Syndrome is a mistake. That they were “accidentally” made like that. But we know from the Bible that God did this on purpose, and that He knows what He did. It is no accident. Pregnancy is an amazing gift from God, but people don’t treat this gift as important as it is. In Iceland they are saying that they are “getting rid” of Down Syndrome, but they are actually aborting babies that are diagnosed with Down Syndrome. More than 4 out of 5 women in Iceland opt for the prenatal test to see if their miracle is diagnosed with Down Syndrome. In Iceland, close to 100% of women whose babies test positive have their child terminated within 10 weeks of conception. People in Iceland say that abortion is just ending something unwanted and imperfect, not murder. The Fifth Commandment says, “You shall not murder.” This includes abortion, so aborting a baby with Down Syndrome is murder, which is wrong. When I hear those numbers and statistics, I think what has the world come to? I think of just one of those lives and the impact his little life has already had on so many. I would like to tell you about David. This year he is going to turn 6 years old. In his almost 6 years of life he has inspired the creation of Spreading Sunshine. Spreading Sunshine has sent over 3,000 Sunshine Boxes, bright and cheerful care packages, to kids in hospitals who are facing serious medical problems. They have also served over 3,500 meals to families whose children in the hospital. This organization all started with a little boy named David (nicknamed Sunshine by his sister, Lily) who was diagnosed with Down Syndrome. His parents were inspired to spread God’s love to families with sick kids. I can’t believe how much of an impact his life has made on others. And to think what is lost every time a baby is aborted. We will never know what God’s plan was for them. In Psalm 139: 14 it says, “I praise you because I am fearfully and wonderfully made; your works are wonderful.” In this verse it should remind us that God made all of us for a purpose. He made you so you can grow and learn all about Him. People with Down Syndrome also have a purpose in God’s plan, just look at what one life inspired. Emerson, Ryder, Max, and David. Let’s just wait and see what God has in store for them. Our Spreading Sunshine community is made up of incredible families, volunteers and donors who believe we can make a difference in the world by spreading love, hope, joy, kindness, and compassion. This month we are hosting a community-wide virtual change drive. To honor our friends with Down Syndrome, would you consider joining us and making donations in increments of $3.21. Late one night, long after our kids should have been in bed, my son Ezra was in the kitchen looking for something. I figured he was searching for a snack, but I was busy and didn’t pay much attention. When he came out of the kitchen, he was holding an unusual contraption. The funny looking mish mash of boxes and tubes was a money collection box for Spreading Sunshine to help pay for meals served to families at the hospital. We all put some change in, and he put in his last bit of money from his wallet. I asked if he wanted to put it all in, and he assured me he did. That’s when I knew this came from his heart. This seed of an idea popped into his mind, and he creatively brought it to life. I admire him, and all kids, for their lack of fear. His expectations weren’t grand. He simply had an idea, had fun, and didn’t worry about what it might or might not accomplish. I admire him, and all kids, for their lack of fear. Honestly, he probably thought we would all give him some change and that would be the end of it. Whatever he collected would have been better than giving nothing. We have so much to learn kids, don’t we? So often we have an idea, but that’s about as far as it goes, at least for me anyway. We get overwhelmed with the details. We are afraid it won’t be successful; we think it has to live up to someone else’s expectations; and we lose confidence. 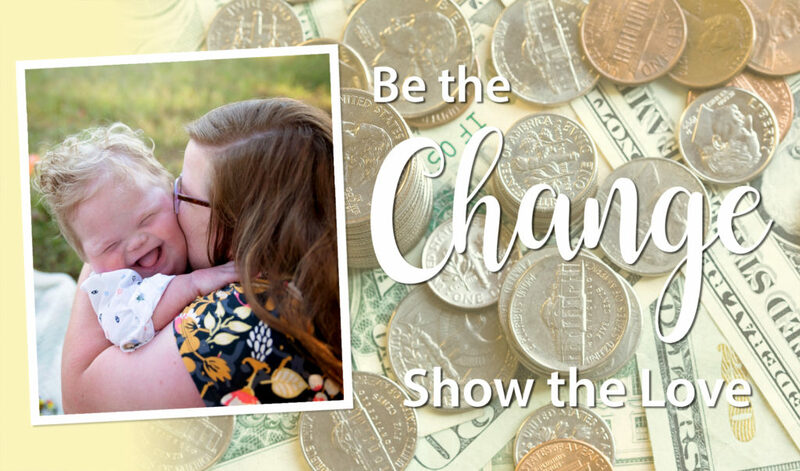 I posted about my son’s change drive on social media and several people commented they wanted to give. By the end of the week he had almost $100. So far he has collected $300!! We still have people donate money simply because they love his idea and want to encourage him in his desire to help others. It reminds me of the little boy who gave his last pieces of bread and fish to help feed the multitudes. Jesus took the little he was willing to give and multiplied it beyond anyone’s imagination, making it more than enough. When we give what we have, not letting limited of resources or fear stand in our way, Jesus will find it sufficient. And He might just do something that leaves us in awe. During the month of March the Sunshine community is joining together for the “Be The Change” virtual change drive. You can participate wherever you live, whatever your age. You can help show families facing pediatric medical challenges they are loved and not alone. 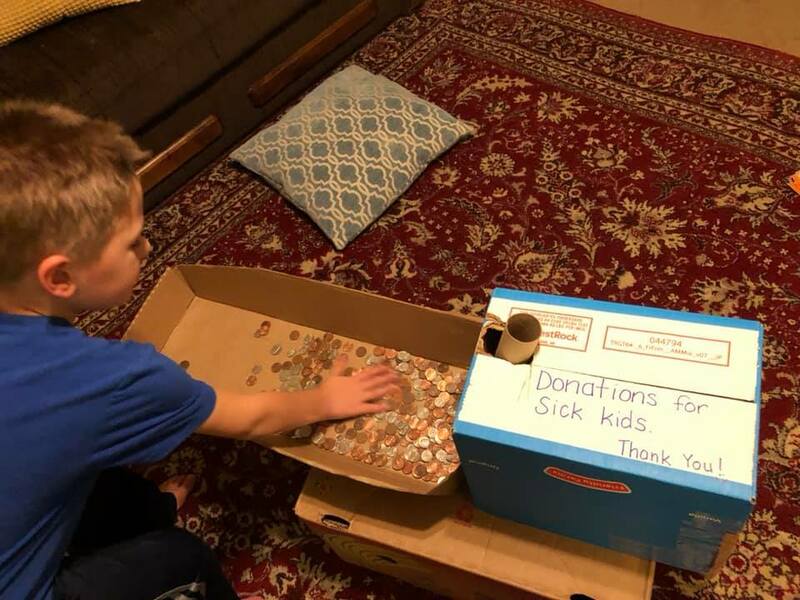 You can join Ezra in his fundraiser for sick kids. 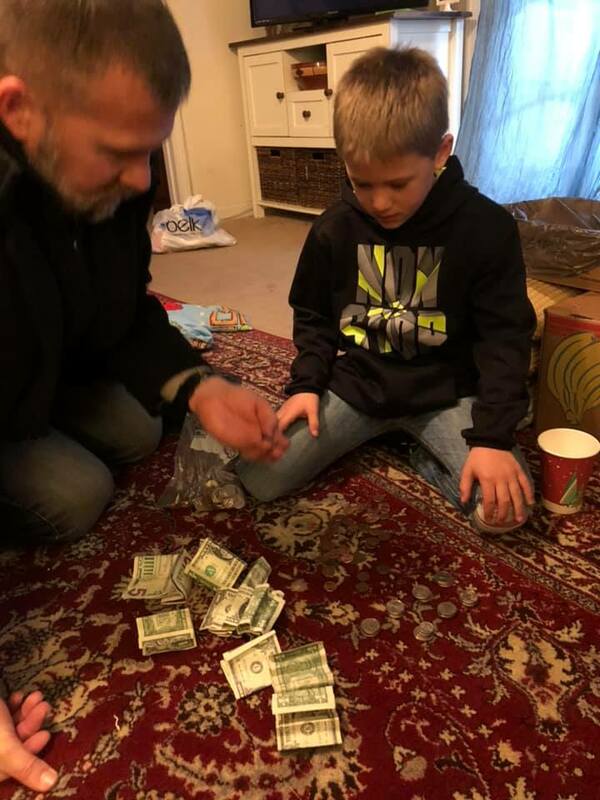 Ezra and his dad counting donations.